During Tuesday’s UFC 160 conference call, company officials weren’t prepared to share who Plan B was if Mark Hunt’s visa issues prevent him from entering the U.S. to fight Junior dos Santos on May 25. Fast forward several hours and FUEL TV’s “UFC Tonight” has just let the cat out of the bag. 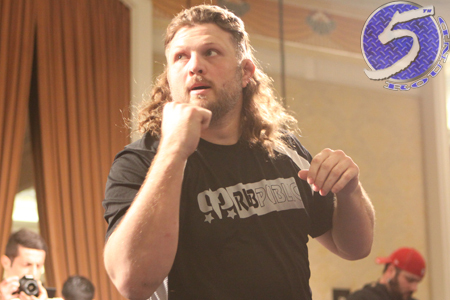 According to reporter Ariel Helwani, the UFC has approached Roy Nelson (pictured) as a possible replacement to rematch dos Santos if Hunt remains persona non grata in America. No word on whether “Big Country” is willing to serve as a last-minute substitute. Dos Santos posted a unanimous decision victory over his buddy at UFC 117 in August 2010. Nelson has won four of his six scraps since their initial encounter, including three straight contests. Nelson quickly disposed of Cheick Kongo last month at UFC 159. Dos Santos, meanwhile, rattled off three consecutive wins en route to capturing the heavyweight crown after beating Nelson. He is looking to bounce back from losing his title in a lopsided defeat to Cain Velasquez. UFC 160 takes place inside MGM Grand in Las Vegas, Nevada. Dos Santos and Hunt are currently slated to co-headline the gig.